The Make Up For Ever HD Invisible Cover Foundation line offers a range of colours to suit almost any skin. I have pink-toned skin and it is difficult to find a foundation of a suitable colour for. Even when advertised as “cool” or “rose”, many foundations are still too yellow. I’d like to applaud Make Up For Ever for realizing that humans come in a wider range of colours than many other companies seem to think. 135 Vanilla is “for medium skin with pink undertones” and it really is rosy! This is a medium coverage foundation with a natural finish. It applies easily and creases only slightly by the end of the day. This is fixable by gently rubbing the crease to smooth it out. HD Invisible Cover doesn’t dry or irritate the skin. It is pigmented enough to cover some blemishes and dark circles underneath the eyes, especially when used in conjunction with Benefit Cosmetics High Beam. 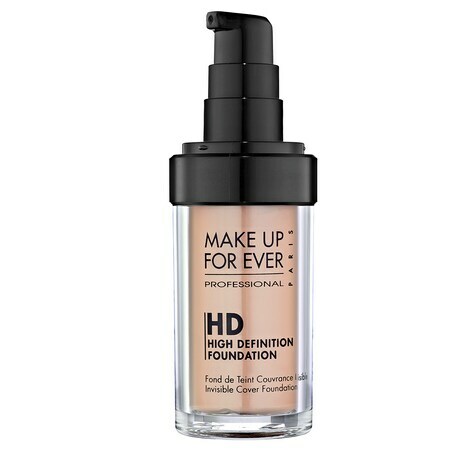 If you are not looking for full coverage, have a hard time finding the right colour foundation, and have a minute in your day to check your reflection for creases, then HD Invisible Cover is good quality. There are other foundations available that crease less (and others that crease more), but they have their own set backs. For the price, HD Invisible Cover is amazing. Make Up For Ever HD Invisible Cover Foundation: 1.01oz (29.9ml) for C$49.00 @ Sephora.ca.